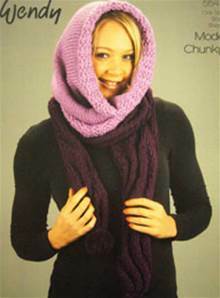 Scarf: 200g. Cowl 67-90cm 200g, 96-119cm 300g. Wendy Mode Chunky, 50% wool/ acrylic chunky yarn. Chunky tension 16st/ 18 rows to 10cm over pattern, 7mm needles.